“Avengers: Age of Ultron” is said to have a budget of roughly $250 million. The Marvel movie required shooting in 25 locations, including countries like Bangladesh, South Africa, Italy, South Korea and England. With all the cast and crew and sets involved, it had to leave a hefty carbon footprint. 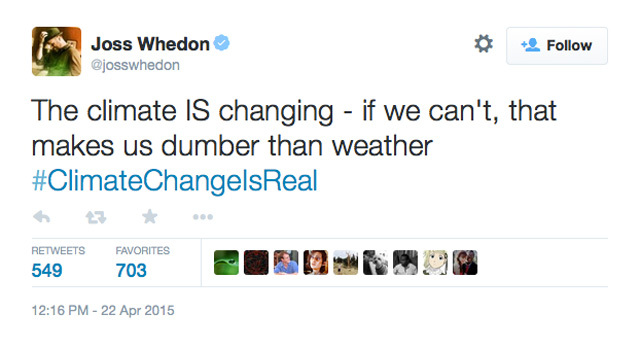 And yet, somehow, director Joss Whedon and Mark Ruffalo (aka: The Hulk) thought it would be a good idea to lecture the rest of us on climate change this Earth Day. 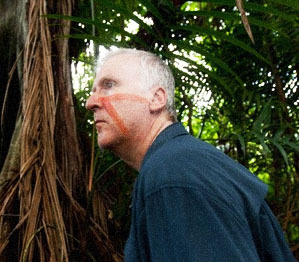 If Joss Whedon really cared about climate change as his self-congratulatory tweets suggest, then he would renounce the kind of big budget movies (and carbon footprints) Marvel Studios leaves all over the globe. He won’t do that though, because he really, really likes the millions of dollars Marvel puts into his bank account. 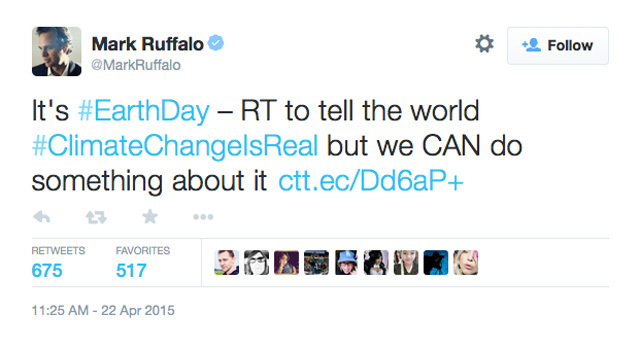 Mark Ruffalo is no different. Yes, we can do something — like not act in a movie with a carbon footprint that 99.9 percent of moviegoers could not duplicate in 10,000 lifetimes. The weird thing about hastags like #ClimateChangeIsReal is that there is basically no one who denies that climate changes. It’s always changed. In fact, yours truly blogged on climate change after my visit to Virginia Living Museum in Newport News, Virginia in 2013. “Since the end of the dinosaur age, eastern Virginia has been covered by ocean water many times. Beneath these seas, layers upon layers of shells, bones and teeth from abundant ocean life accumulated to form fossil-bearing sediments. 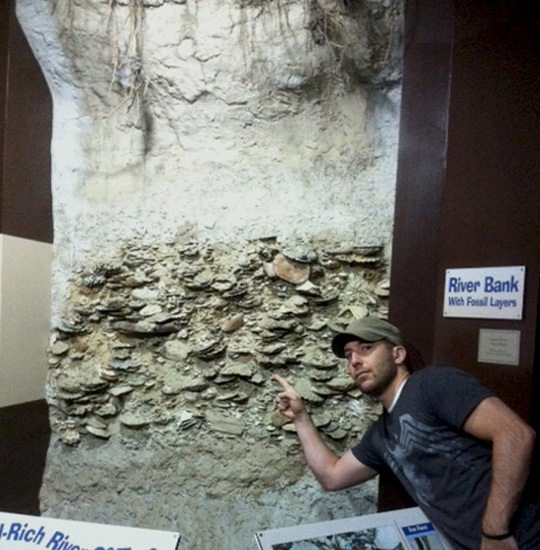 Coastal river bluffs now display these ancient sediment layers, in particular, a 3.5-to-5 million-year-old fossil-rich band called Yorktown Formation,” (Virginia Living Museum). It is safe to say that the climate has changed quite a bit over the course of 5 million years — so much so that the great state of Virginia has been underwater multiple times. How much does man have an effect on climate in relation to things like that giant ball of exploding gas called the sun? If man is responsible for significant changes to the earth’s ever-changing climate, what are the proposed political solutions to the problem? Will the political solutions put forth by Hollywood actors and directors result in losses to freedom and liberty? Will the political solutions put forth by men like Mark Ruffalo actually have any tangible effect? Those are questions Messrs. Whedon and Ruffalo aren’t comfortable answering, which is why they opt instead for tweets that result in fawning praise by their Twitter followers. The next time these guys essentially try to shame you because you like nice long showers or vehicles that don’t run on batteries, ask them how it feels to be a part of the Marvel Cinematic Universe juggernaut and its Galactus-sized carbon footprint. My guess is that that they’ll run away faster than Quicksilver. If someone asked my daughter a question about the earth and she responded, "Sometimes I wish we didn't exist," I'd be extremely concerned. No child should ever question their existence or self worth. The woman in this picture just smiles as if she was infected with something The Joker cooked up. Her silence speaks volumes about the green movement. It was only yesterday that I covered the Sith-environmentalists who made George Lucas beg for mercy, winning a war of attrition that lasted decades. What I neglected to mention is that these same people target kids. They need another generation of storm troopers to bully the rest of us around, even if deep down they wished we were all dead. 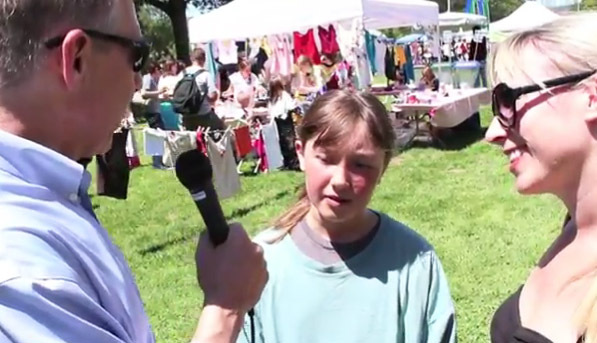 Exhibit A: the sixth grade girl Brian Sussman, author of “Eco-Tyranny,” interviews at Santa Cruz’s Earth Day Festival. I mentioned the weird self loathing environmental activists have during a recent post, but video of one of their young pupils deserves coverage. Brian Sussman: What is the most serious threat facing humanity today? Brian Sussman: What are the humans doing to the planet? What are they doing to harm the earth. Student: They’re polluting. The birds and animals eat it and then they die. Brian Sussman: How does that make you feel? Student: I wish they didn’t pollute…and sometimes I wish we didn’t exist. Brian Sussman: How much of this are you learning about in your school these days? Student: We’re learning a lot about it, but I don’t know about other schools. Most people who watch the video zero in on the girl, who sadly has been inculcated to believe her mere existence is a burden. However, perhaps the scariest part of the video is her mother, silently grinning off to the side for the duration of the interview. She almost looks as if she was infected with some of the chemicals the Joker cooked up in Tim Burton’s Batman. Every human being has self-worth. In fact, you have a right to be here. You have a purpose, and as such you should never feel guilty for being alive. People who walk around wishing they were dead won’t respect your right to life. They won’t think twice about messing with your basic freedoms and liberties, and so it should come as no surprise that totalitarian tendencies show up every time you run across a true believer of the green movement. If you believe humans are a scourge upon the planet and if you believe there are “too many people,” then it only becomes a matter of time before the ends justify the means. Green activists are scary, even if they do a good job hiding their frightening side behind smiles and heartfelt testimonials. Underneath their patty-cake hippie exteriors are ruthless people who will stop at nothing to force you into compliance with their worldview. The solution? You have to fight harder for freedom and liberty than they do for oppression and tyranny. Captain Planet’s Earth Day marathon: Ignore the utility bill? Earth Day is coming up, and it wouldn't be complete without a 14-hour marathon of Captain Planet. As you rack up a huge electricity bill taking part, ask yourself this question: Why does Captain Planet hate oil when it comes from deep within the bowels of Gaia? Earth Day is coming up April 22nd. This year, besides the usual claptrap from academics who think the world would be a greener place if the United States became an irrelevant outpost in a world filled with tyranny, we get a 14-hour Captain Planet marathon on the Boomerang Network. For those of you who are unfamiliar with Captain Planet, the character was the end result of Ted Turner’s desire to inculcate a generation of kids with leftist environmental propaganda. In an effort to inform younger viewers about serious environmental issues, legendary cable entrepreneur Ted Turner partnered with DIC Enterprises in 1990 to create the world’s first animated environmental series, Captain Planet and the Planeteers. The half-hour series was about a group of young people (The Planeteers) who combine their special individual powers (given to them by Gaia, the Spirit of the Earth) to summon Captain Planet, an environmental superhero, to battle the world’s worst eco-villains. Week after week young kids were bombarded with the idea that corporations are inherently evil. For six years kids heard, “The power is yours!” when it came to stopping environmental damage, but the real message was that people were the problem. Only recently (and from a liberal website, no less), did anyone of note bother to point out the weird self-loathing that was at the “heart” of the show. Contrast Ted Turner’s message with that with individuals like Becky Norton Dunlop, who understands that we should be counting on more people and more corporations with new and exciting ideas to solve our problems—not less. It isn’t less people and a smaller carbon footprint we should be aiming for to address environmental concerns. What we need to be doing is creating an environment where the best and brightest minds are cultivated in ways that will bear technological fruit. The other day someone told me we were “running out of resources.” False. People have been saying that for ages. Humans keep inventing new ways to tap natural resources, allocating them differently as tastes and conditions change, finding new reserves, and becoming more efficient as a whole. Every time I hear someone talk about “population control” I cringe and think of Communist China. The world doesn’t need less people; it needs more free people. Free people come up with ideas that change the world. Free people find ways to raise the standard of living for hundreds of millions (or billions) at a time. As I’ve said before, ask Bill Gates about that. Look at what Steve Jobs accomplished. Those are only two recent examples using household names, but there are countless others. 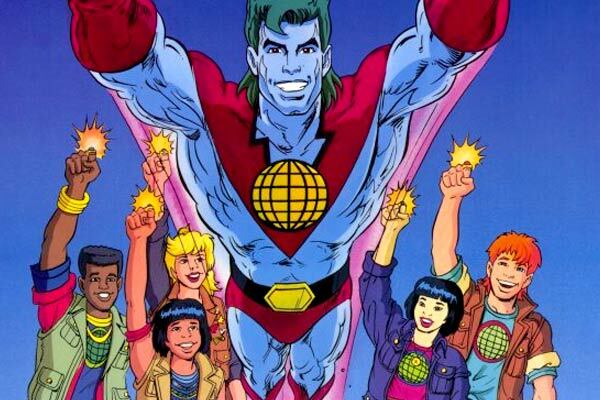 This Earth Day, if you run up a large electric bill watching 14 hours of Captain Planet, don’t worry about it. What matters isn’t how you spend your recreational time as much as what you do when you’re on the clock. And with that, I leave you with this question: If Captain Planet was standing at ground zero when Mount St. Helens erupted, spewing untold amounts of ash and soot into the atmosphere, would he gain the strength of a supernova, or would he die instantaneously? William Shatner: May His Carbon Emissions Never Cease. If Stalin cut carbon emissions by hundreds of millions of cubic tons, does that make mother earth happy? And why do I have this weird self-loathing that grows in concert with my bank account? So right now I am panicking. And in my panicked state, I become shrill and unrealistic. So I am calling for four actions–at least one of which, in particular, is robustly unappealing. I’m not going to bother with his third and fourth propositions, because the first two bullet points are already giving me a headache. It used to be that liberals called on the United States to be a better member of the “world community” (i.e., they wanted us on equal footing with countries like Iran, North Korea, and any number of backwards nations run by weird warlords with a penchant for tuxedo shoes). That was bad enough… But now we find out it was all one big euphemism for grovelpolitik. Reagan had peace through strength. Your liberal economist from Berkeley has peace through lowliness. The plan seems to become an irrelevant outpost in a world filled with tyranny. The second point is interesting, in that, if government control was strongly correlated with cleanliness the Soviet Union would have been a paragon of Green Living. Instead, it was simply Red. With blood. I suppose you could count the weird shade of green gulag victims turned after our Commie counterparts were done with them… Sometimes, strange microbial things feed on your body when you die. And bizarrely, there probably is a strain of the environmental movement that quietly cheers Stalin’s handy work in “cutting down on carbon emissions” by millions of cubic tons. I’m assuming they would also redefine murder as “aged zygote termination” or “blastocyst from the pastocyst” wish-fulfillment. Regardless, the difference between conservatives and liberals when it comes to solving our environmental problems couldn’t be clearer. Liberals have strange self-loathing and subconsciously think we’d all be better off if there were a few billion people less in the world, and conservatives believe the answers to our problems can be found by mining the creative mind of man. We are the world’s greatest resource, whether liberals like it our not. Exhibit A: Alpha Zygote William Shattner. Darn it, you conservatives: You're not humans. 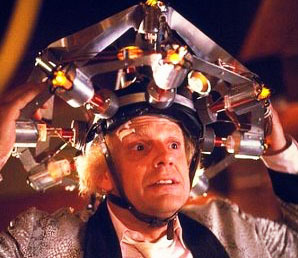 You're always just a zygote somewhere in the space-time continuum.